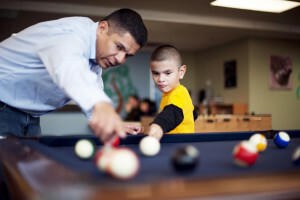 It is estimated that in San Diego County alone, more than 15,000 children have a parent in prison. For that reason, Big Brothers Big Sisters of San Diego has once again decided to step into the gap and provide mentors to some of San Diego’s most worthy children. Big Brothers Big Sisters of San Diego County partners with local nonprofit organizations and faith-based organizations to recruit volunteers for this program. Amachi is a West African Ibo word meaning “Who knows but what God has brought us through this child.” The Amachi program dates to 2001, and was the result of a collaborative think tank which included the University of Pennsylvania, Pew Charitable Trust, Public Private Ventures, and Big Brothers Big Sisters of America. Then, as now, the mission was/is to break the intergenerational cycle of crime and incarceration and give a forgotten (invisible) group of children the chance to reach their highest potential. Using the Community-Based Mentoring and Amachi models, BBBS in San Diego County serves children ages 7-18 whose parent(s) are incarcerated. Our Amachi Program connects children with role models from all walks of life, but particularly those from local religious organizations. Houses of worship and their members are able to provide a safe, stable environment for children to develop into responsible young men and women. How did the Amachi program begin? The original Amachi program started in 2001 in Philadelphia as a mentoring program within Big Brothers Big Sisters of America. It began in San Diego in 2006, with visionary support from The Cohn Family, of Cohn Restaurant Group. How does BBBS find the Amachi Children? Amachi children are much like all Big Brothers Big Sisters children. The only characteristic that identifies them as an Amachi child is a link to an incarcerated parent. Most parents or guardians of Amachi children apply directly to Big Brothers Big Sisters in an effort to provide a positive role model for their child. Does the parent in prison know they have a mentor? We make every effort to inform the incarcerated parent that their child has a mentor and often he/she is the person who initially enrolled their child in the program.